My corner beer store just got in a shipment from the Alaskan Brewing Company of Juneau, Alaska. I've been wanting to sample more beers from this brewery ever since my trip to Alaska last summer. I picked out a 22 oz bomber of their Alaskan Amber - alt style beer. I admit that I first thought that this was an Amber Ale and that's why I chose it. But upon further reading of the label, this is classified as an Alt style. Alt is the German word for Old and are typically conditioned longer than most other beers. Supposedly the longer conditioning mellows out the fruitiness of the malts. This beer was brewed with a combination of premium 2-row and crystal malts. The hops were a mix of Cascade (probably what I'm smelling up front) and Saaz hops. The Saaz hops give this beer a more Czech style to it. Cascade is more citrusy up front and somewhat biscuity. This was a low hopped beer with a 18 IBU rating. This beer is a borderline session beer as it comes in around 5.0% ABV but doesn't hit you up front like those imperials do. Appearance: Alaskan Amber gave a nice shushhhh as I popped the bottle cap. The beer poured a nice deep red color - just what you'd expect from the name. Their wasn't much of a head. It had about a 1" initial head that faded almost immediately and disappeared almost entirely. There was a lot of carbonation in this beer however. There was a constant stream of bubbles coming up from the bottom of the glass. Aroma: I could immediately smell the aroma of a sweet banana like quality, with some bubble-gum like traces. It was a fruity, almost citrusy aroma, much like the Belgian beer I had the night before. It was rather pleasant. 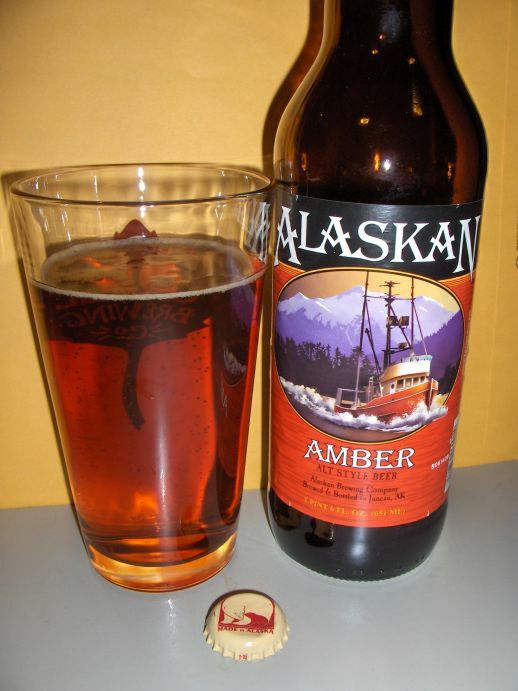 Taste: Alaskan Amber's taste was nice and malty with just a hint of bittering. It was well balanced. The carbonation on this beer tingled the tongue. It finishes rather smooth with no aftertaste. I could easily drink this beer as a session beer. Finishing the entire 22 oz bottle took little to no effort. It's clean, almost creamy. I'd definitely drink this again if offered to me. In 2008, Beeradvocate gave this beer a good "B" rating while Ratebeer put this in the 78th percentile and a 3.4/5 rating. So it's rated a bit above average for an altbier. This to me is a good example of how a balanced beer should taste. It's good, but doesn't exactly stick out from the crowd as outstanding. I would have preferred that it have a head that would stick around longer than it did. A beer without a lingering head tells me that something is amiss. It could have been the temperature. Next time I will cool this beer down even further. I'll give this beer a slight thumbs up and rank it as worth trying again, but not outstanding. Certainly worth a taste if you haven't picked this up before. - Alaskan Black IPA review.